I have a few of these cameras, in this exact style, sitting in a drawer. Now that my phone takes photos and automatically loads them to my computer without any effort on my part, it all seems so tedious to use these cameras. Plus, the film, if available is roughly $1 a photo. I hope to pull them out again and play with them. Some day. Land cameras are instant cameras with self-developing film named after their inventor, Edwin Land, manufactured by Polaroid between the years of 1947 and 1983. Though Polaroid continued producing instant cameras after 1983, the name ‘Land’ was dropped from the camera name since Edwin Land retired in 1982. The first commercially available model was the Polaroid Land Camera Model 95, which produced prints in about 1 minute, and was first sold to the public in November, 1948. 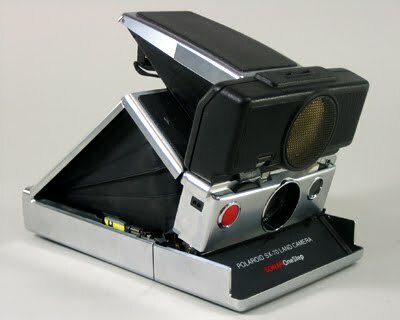 The SX-70 is a folding single lens reflex Land camera which was produced by the Polaroid Corporation from 1972-1981. 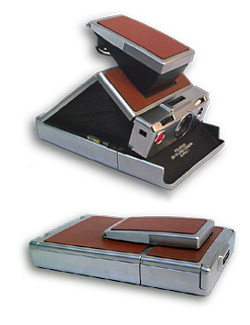 The SX-70 included many sophisticated design elements. A collapsible SLR required a complex light path for the viewfinder, with three mirrors (including one Fresnel reflector) of unusual, aspheric shapes set at odd angles to create an erect image on the film and an erect aerial image for the viewfinder. Many mechanical parts were precision plastic moldings. The body was glass-filled polysulfone, a very rigid plastic which could be plated with genuine copper-nickel-chromium. Models 2 & 3 used the less expensive and more-easily cracked ABS in either Ebony or Ivory color. The film pack contained a flat, 6-volt “PolaPulse” battery to power the camera electronics, drive motor and flash. The original flash system, a disposable “Flash Bar” of 10 bulbs from General Electric, used logic circuits to detect and fire the next unused flash. Polaroid SX-70 film was introduced to the market in 1972, and was a market success despite some problems with the batteries on early film packs. The original SX-70 film was improved once in the mid-’70s (New Improved Faster Developing!) and replaced in 1980 by the further advanced “SX-70 Time-Zero Supercolor” product, in which the layers in the film pack were altered to allow a much faster development time (hence the “time zero”). It also had richer, brighter colors than the original 1972 product. There were also professional market varieties of the SX-70 film including 778 (Time Zero equivalent) and the similar 708, Time Zero film without a battery, intended for use in applications such as the “Face Place” photo booth and professional or laboratory film-backs, where a battery is not needed. Time Zero was the film manufactured up until 2005, though overseas-market and some last run film packs were marked only as SX-70.